Tyler Jeffrey Dillashaw is an American mixed martial artist and former UFC Bantamweight Champion. 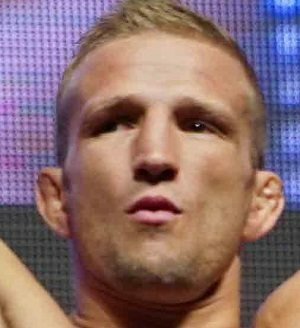 Dillashaw was born in Sonora, California and went to Bret Harte High School. He competed for the schools wrestling and football team. He has a black belt in Muay Thai under Duane Ludwig and a blue belt in BJJ. T.J. Dillashaw made his MMA debut in 2010 and won his four first pro fights, three by stoppage and one by decision. With a pro record of 4-0 he was accepted to be a contestant on The Ultimate Fighter Season 14. T.J. Dillashaw’s first fight to get into the house was against Matt Jaggers, who Dillashaw defeated by TKO. 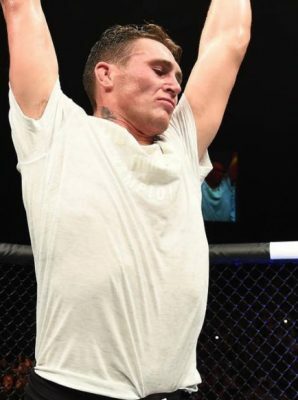 He was chosen to be on Team Bisping and won his next fight against Roland Delorme by rear naked choke to advance to the semi finals. In the semi’s he faced Dustin Pague, who he dominated for three rounds. With the win he secured a spot in the finals against John “The Magician” Dodson. The finale took place in Las Vegas, Nevada and was billed The Ultimate Fighter 14 Finale. Dillashaw lost the fight against Dodson by TKO in the first round. Dillashaw went on a tear after the loss, winning four straight fights before losing a razor thin decision against highly ranked Raphael Assuncao at UFC Fight Night 29: Maia vs. Shields. Once again Dillashaw rebounded and won his next fight against Mike “The Hulk” Easton. With the win he got the chance to face the Bantamweight Champion Renan Barao. T.J. Dillashaw faced Renan Barao at UFC 173: Barao vs. Dillashaw in May of 2014. Dillashaw dominated the champion and won by TKO late in the fifth round to become the new champion. He also got double bonuses, Fight of the Night and Performance of the Night. His first title defense was supposed to be a rematch with Barao, but Barao fell ill during the weight cut and Joe Soto stepped to face Dillashaw on less than 24 hours notice. Dillashaw defeated Soto in a pretty even fight, but once again Dillashaw defended his title by a TKO in the fourth round. The two faced off once again at UFC on FOX 16 – Dillashaw vs. Barao II in July of 2015. Dillashaw put an end to the rivalry and TKO’d Barao in the fourth round, earning another Performance of the Night bonus. Dillshaw faced the former champion Dominick “The Dominator” Cruz at UFC Fight Night 81: Dillashaw vs. Cruz. In a razor close decision, Dillashaw lost his belt to Cruz. He then rematched Assuncao and won by unanimous decision, and also beat John Lineker by decision. After a coaching gig opposite former teammate and current Bantamweight Champion Cody “No Love” Garbrandt, the two were supposed to fight after the season, but a back injury sustained to Garbrandt halted the fight. They will face off at UFC 217: Bisping vs. St-Pierre in Madison Square Garden, New York on the 4th of November.